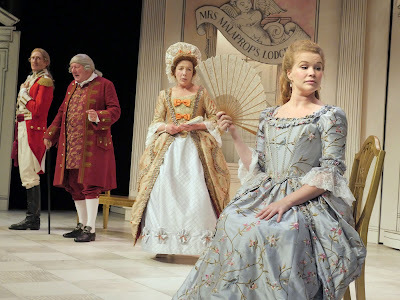 Last week in Keswick I saw a very good production of one of the great stage comedies of English literature: The Rivals from 1775 by Richard Brinsley Sheridan. The play is set in Georgian Bath and the production was unfussy and effective, done in period dress. The acting was very good all round - considerably better than the acting of the Royal Shakespeare Company production of Midsummer Nights Dream that I saw in July - and the actors all looked and sounded right for their parts. Sheridan's Rivals is one of only a small handful of plays between Shakespeare and Shaw to have kept their place in the repertoire of commercial theatres - its companion p[ieces from the same era are Sheridan's School for Scandal (to some extent) and Oliver Goldsmith's She Stoops to Conquer. What made The Rivals survive in theatregoer's affections when so many hundreds of once popular plays fell by the wayside? Number one is the character Mrs Malaprop - a self-important, gullible, ridiculous and pretentious middle aged tyrant who mangles and misuses the language and gave rise to the 'malapropism'. Number two is the well-crafted and intricate plot (albeit very farcical) - which takes a well to set-up in the exposition, but then unwinds very satisfyingly. But perhaps most important is that every character is distinctive and individual - except perhaps the young Captain Jack Absolute, who is rather a generic handsome young 'juvenile lead'. But each of the others is that kind of vivid, distinctive, eccentric which we nowadays associate with Dickens; and which used to be called a 'humourist' in the sense of someone displaying a strong personality driven by an unusual combination of the four 'humours'. Sir Anthony Absolute at first seems like a pantomime villain, but turns-out to be a man overpowered by whatever happens to be his present mood; which can change in a moment. Lydia Languish - the heroine - has a bizarre desire (derived from reading too many novels - than a fashionable novelty) to marry a man of modest rank and live a life of picturesque poverty - this is the comedy-generating barrier to the courtship of Jack Absolute, who is rich and titled. Jack's friend Faulkland is desparately in love with Julia who returns his devotion; but he lives is a frenzy of anxiety and suspicion because when she is miserable he thinks she will die, and when she is happy he thinks her indifferent. And all the other personae, including the servants, have very distinct and somewhat off-beat or eccentric characters. In sum, The Rivals is a display of old English characters. Yet the author is, like most of our best dramatists (e.g. Goldsmith, Wilde, Shaw, Synge, Beckett... and there are many others who were not dramatists), Anglo Irish - that is, Sheridan is from the Protestant gentry who colonised Ireland after the Elizabethan conquest. Although these many and first-rank Anglo-Irish writers were mostly born and early-raised in Ireland and often had Irish accents; they were generally more-English-than-the- English in terms of their work; perhaps bringing a slightly alien and fresh eye to English manners and assumptions. 'Gad ! sir, I like your spirit ; and at night we single lads will drink a health to the young couples, and a husband to Mrs. Malaprop. I like the simple poetry of 'we single lads' - these being himself as a widower and the two unsuccessful 'rivals' for the hand of Lydia - and the recognition of the underlying sadness and vulnerability of Mrs Malaprop - whose marriage is needed to complete the comedy.